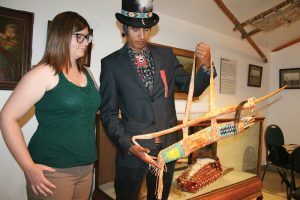 Fort Museum collections manager Ashley Hardwick and Jani Red Gun with a bow and arrow he created using traditional knowledge shared by Blackfoot elders. Jani Red Gun used traditional knowledge shared by Blackfoot elders to fashion a weapon similar to ones used by Plains people on the buffalo hunt. The 24-year-old Red Gun, who is from the Siksika Nation, made and donated a 32-inch “push” bow to The Fort — Museum of the North West Mounted Police. Blackfoot warriors used the bow to hunt buffalo, predominantly from horseback, from the 1700s until the introduction of the rifle to the Plains people. “The introduction of the gun really changed things,” Red Gun said. Red Gun explained the bow differs from those commonly used in that the hunter notches the arrow and pushes the bow forward, rather than pulling back the string. It is a short bow, so hunters had to ride right beside the buffalo in order to deliver a killing shot. “It’s a short bow so they would have to be close to get it in the heart or lung,” Red Gun said. Red Gun was about 16 years old when he started working with the Siksika Nation elders. “They gave oratory instructions,” Red Gun said. Red Gun sources a 45-inch length of Saskatoon wood with a two-inch diameter. Dogwood or ash would also suffice. He tries to find a piece that bends the way it will as a bow. Red Gun dries the wood for five to six months. “I just like to have that extended drying period so it is strong,” Red Gun said. “I would then start whittling the wood,” Red Gun said, explaining bark is left on one side so it remains one strong piece of wood. Red Gun used a buckskin hide given to him by his brother to create the sheath for the arrows. He treated the hide himself, scraping away the epidermis and using the animal’s brains to tan it. “You scrape it off as clean as you can,” said Red Gun, who substituted modern tools for the stone or bone instruments his ancestors would have used. Red Gun fashioned arrows from 24-inch saplings and flint-knapped the arrowheads in the traditional way. 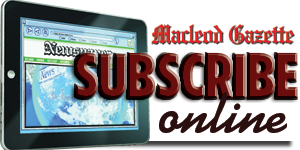 “A warrior hunter would have to do this,” Red Gun said of the craft of making bows and arrows. In his ancestors ‘time applying beadwork would have been the job of women, but Red Gun did it himself in the traditional way. The colours of the bead work are tied to nature. Turquoise represents water, orange represents the sun, and yellow is for the prairies. Red Gun would like to learn to shoot the bow while mounted on a horse, and to enter competitions built around that skill. There is competition world-wide. Museum collections manager Ashley Hardwick said the collections committee is reviewing the bow and arrows and if approved, the items will be displayed in the Blackfoot Gallery. Red Gun’s bow already has the approval of his elders.